Hi Any, we have been suffering from an intensely hot season these days, but I guess we are better off compared to the heat in Russia. Thank you for your article! The children are adorable! I hear children from 8 to 12 years old are in the best age to learn new languages. Hopefully the children you taught this day would grow up and help building bridges between Russia and Japan! Today I'd like share the interview of the JF staff of the conference "Future Leaders Forum 2010 Korea-Japan-China". This conference is targeted to enhance mutual understanding between intellectuals from Japan, China, and Korea. Representative of 6 different genres (politicians, bureaucrats, academics, journalists, business, and NGO/NPO) from each of the three countries participate in discussions and fieldworks. 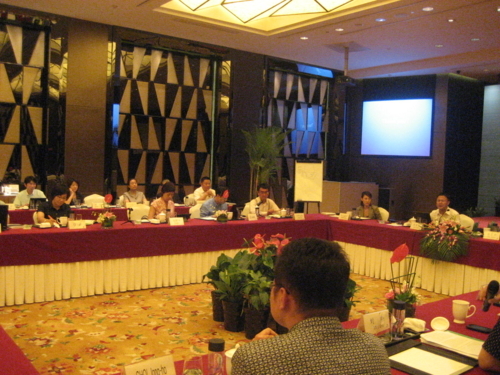 This year, 18 participants gathered and had vigorous debate on the main theme "Vision2030 for Northeast　Asia" in Jeju, Okinawa, and Shanghai. The conference lasted for 11 days. Let us now interview T and M in charge of this program. They are both from the Asia and Oceania Section. What did you find the most difficult in working for this program more than a year? M: Working with the staff from Korea and China was a little challenging. Due to the different conditions, sometimes we couldn't reach an agreement quite easily. For example, there was a new idea that we should only visit one country, instead of visiting three countries as in the past. T: But visiting three countries is what makes this program so special. By being both the "host" and "guest" during the program, the participants get to share common values. After several discussions, we finally agreed to visit three countries as we always have been. T: One participant said "I used to think that chitchats were pointless. But now I know they carry a lot of weight". Things like "This tastes good!" or "Looks like we need an umbrella today" are almost subconscious dialogues without any big meaning or intentions indeed. But I think having that kind of friendly conversation makes a difference in a relationship. M: You can't have chitchats unless you spend some time together. And it's rare to share time with people from different affiliations. I guess that's why this program is considered valuable. Were there any approaches you took this year that you'd like to continue next year? 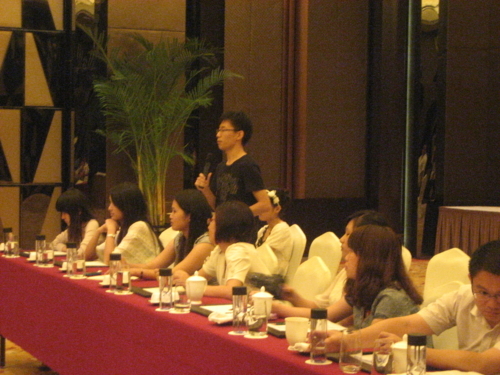 M: In Shanghai, we had students participate in one of the sessions. They were ready with sharp questions, making the discussion even more lively. We might try this again next year, and yet we also have to think about the balance of time needed for discussions within the participants. There are many things we'd love to do, but time is limited. What about reflections you'd like to improve? T: We probably should try harder in sharing the vision. I'm talking about everything, ranging from the vision within the staff group, participants, and fieldworks. For example, we, as staff, must at least share why we have chosen the fieldwork we are heading to before we actually go there in order to enrich the discussion further. Tell us about the tasks to be solved in the future. M: Strengthening the relationship. We must not forget to follow up on this program, or it would just become a temporary event. Many people are eager to launch a trans border alumni association including those who participated in the past. T: That's wonderful, but on the other hand I also believe we should continue the interaction among the three countries WITHIN the country of their own. That is to say, for example, there are countless opportunities to meet Korean employees or Chinese students in Japan. To continue such interaction on a glass-root basis can lead to larger scale activities. Lastly, can I have a comment on what was gained most from the program? M: The bond between the staff members from Korea and China. It was an amazing experience to share the effort and work towards the same goal. The program has just ended, but I'm already looking forward for the coming year already! T: The Rediscovery of our mission. We are sort of magicians that can turn the relationship between "country and country" to "person and person". Take us for example. I want us to be me and Ms. M, not China and Japan. Thank you. I guess our mission is to create a global atmosphere that the name of a country reminds people of not just the flag but people who live there, or people who you met. Besides, this program was productive in bringing people together from different backgrounds. You know, it's often the case we tend to have somewhat biased or extreme impressions towards people you don't know (or is it just that I have lopsided views? hope not!) Anyways, it looks like our next goal is to make us of the extraordinary experience of this program and actually reflect it in our everyday lives. Next is Nunzia from Rome!